Welcome to the new year, the Year of Bread! I should point out that I've been baking bread (for sandwiches) pretty routinely for a couple of years now. I started thanks to the Great British Bake-Off season 1 which I saw some time after it actually aired (since I don't live in the UK). I've played around with a few sweet breads and not much else. I'm going to take the inspiration from last year to try out a bunch of new things this year in bread land. Not overly pretty but I'll be working on that! The first recipe for this year is from the Bake Off, season 4, by Ruby Tandoh, adapted from her recipe posted on the BBC website. 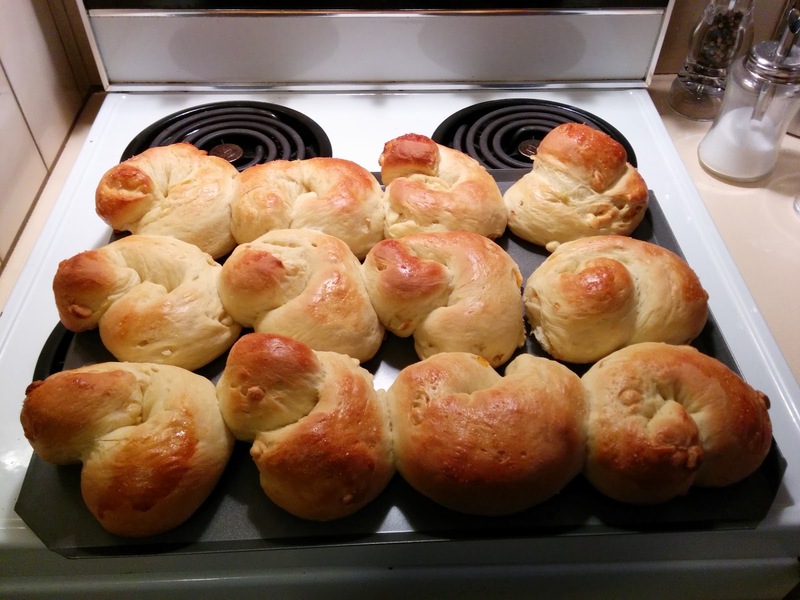 The main deviation from her recipe is adapting it to 12 buns instead of one ornate loaf. Other changes are noted in the method. Bring the milk to the boil in a saucepan and then remove from the heat and leave to cool. Top up with water to make 400ml total of liquid – the mixture should be lukewarm. Add the sugar, yeast, salt, flour and ground cardamom to a large bowl and mix. The dough will be very sticky - have a plastic bowl/bench scraper handy. Mix in the lukewarm milk and water mixture, egg, softened butter and orange zest. Combine using your hands. Ruby's instructions had only ¾ of the liquid added initially, then more added afterwards as needed. I found the dough needed all the liquid and also adding it afterwards was quite difficult and annoying. Next time I'll just add it all in one go. Knead the dough until it's smooth, elastic and no longer sticky (yes, it should stop being really sticky after a couple of minutes). Knead in half of the chocolate chips and half of the candied peel. Shape into a ball, place in a large oiled bowl, cover and leave for 1-1½ hours, or until doubled in size. Knock the air out of the dough. At this point Ruby gets very fancy with her peacock loaf - check the original recipe if you'd like to do that. For 12 buns split the dough into 12 even portions. Form each one into a little ball. Squish each ball flat, add a bunch of the remaining chocolate and peel on top and push it in a little. Roll the dough over to seal it and then roll out until it's about 15-20cm long. Loop the dough around one end in a spiral fashion and tuck the loose end under the middle. Place onto a baking tray lined with baking paper. Cover the buns with a dry towel and let rise for 45 minutes. Preheat the oven to 190ºC before the rising is complete. Brush with an egg or milk wash if you like - the sugar in the dough will cause the buns to brown up nicely regardless. I used an egg white wash but I think I'll skip it next time. These are very, very yummy. Not too sweet and just the right amount of flavour.